Both lovers of the outdoor life, each having very different leisure interests but both linked by the love of their home and garden. Anne’s abilities as a patient skilful gardener are apparent in beautiful specimens of the plants she rears and maintains. As well as the water plants her Hosta and Daylily collections are a testiment to her abilities. 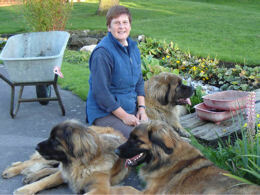 Her relaxation and greatest thrill in life now comes from her Leonberger dogs of which she has 3 at them moment. She occasionally breeds and shows them, qualifying regularly to Crufts. If you ever visit ‘The Water Garden’ and are interested she is always happy to chat dogs! As a Picean there can be only one theme in his life. Water! 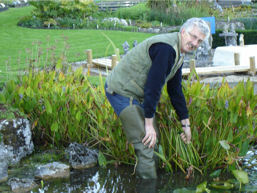 He enjoys nothing better than wading about in muddy water up-rooting waterlilies, catching fish or simply enjoying the wet stuff. Designing water courses, digging new ponds, building water filters, are all heaven sent pastimes to him. As a leasure pursuit, well a boat on the Thames seems the only logical progression and on the few days that are free in the summer months that’s were you will find him.